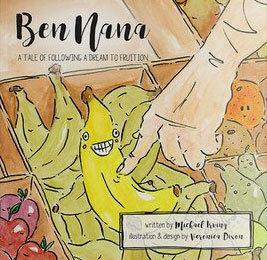 Ben the banana is excited to fulfil his role in being a tasty healthy treat for his humans. But as the week goes on after being purchased at market, everyone around him reaches their goal but him and he becomes quite worried that he’s been left behind. He doesn’t give up hope though and after a dark moment he finds that he hasn’t been forgotten, and is subsequently turned into banana bread! It’s a short rhyming tale with the moral of never giving up hope on your dreams. The book has been well reviewed by parents and teachers alike. Suited to prep - grade 4 children.